The inputs for Phase 3--Managing Implementation and Change include the “Should” process, recommendations, and an implementation strategy. 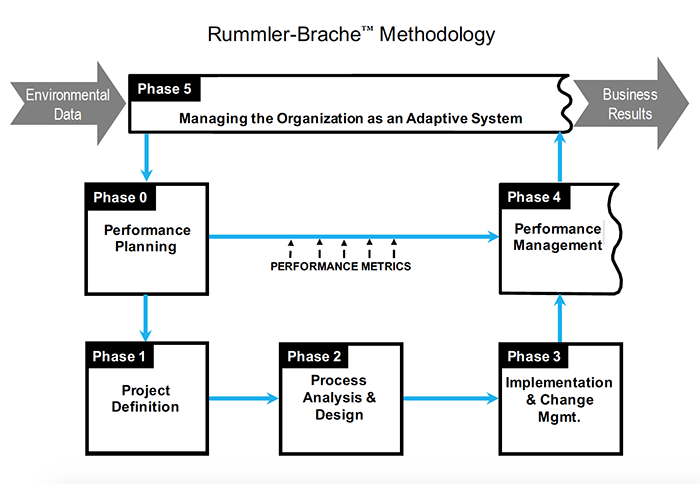 Phase 3--Managing Implementation and Change overlaps with Phase 2--Process Analysis and Design. This overlap involves specific implementation actions that will influence the “Should” process design. Determine implementation team structure—identify cross-functional team members and leaders. Prepare detailed implementation plans—installation of a “Should” process can require new measures, organization structures, policies and procedures, information systems, and job descriptions. Develop whatever is necessary for the change. Prepare the organization for change. Evaluate the results of the pilot. Incorporate the results back into the development cycle. Cutover to the new process—involves signaling the start of use of the “Should” and taking conscious steps to undo the “Is.” Old systems are dismantled. Institutionalize changes—the “Should” becomes your new way of working—your new “Is” as you move into the Performance Management phase. The output of Phase 3 is an up and running, redesigned process.